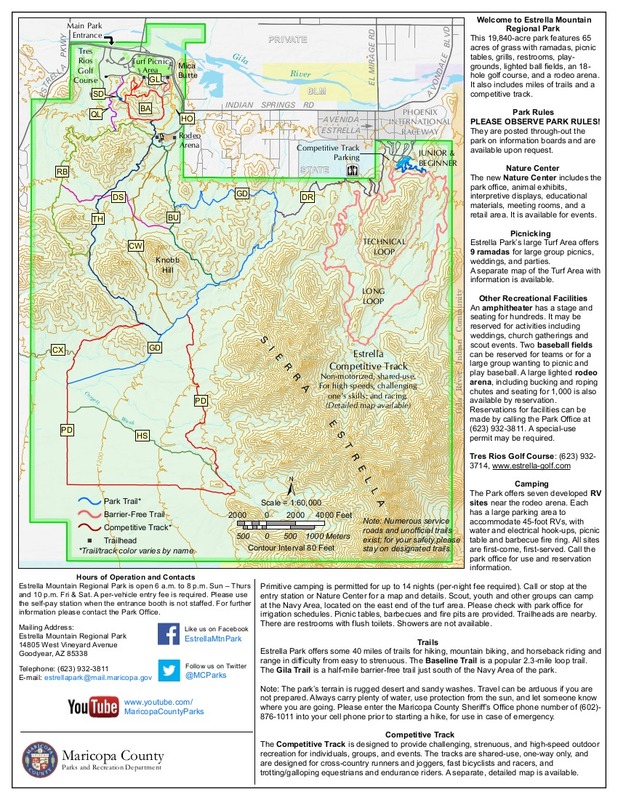 Overview: Estrella Mountain Regional Park is located about 20 miles west and south of Phoenix in the foothills of the Estrella Mountains. It was established in 1954 with the purchase of 800 acres. Today, the Estrella Park stretches for almost 20,000 acres. It has a wide range of amenities including horseback riding, a rodeo arena, golfing, fishing, baseball diamonds, a 65 acre grass picnic area and trails for hiking and biking. The park has 14 trails that extend for 36 miles into the Park. This is one of the newest trails in the preserve, having been created a little over a year ago. Hike: This is another one of those trails that you need to hike into the park to get to. I would speculate that it was created more as a convenience for residents of the Estrella Mountain Ranch Community than for any other reason. The reason I say this, is that there are two ways of reaching this trail. If you are hiking within the park you have to hike 5 miles to reach this trail (via the Toothaker and Pedersen) and then, if you follow this trail, it runs for approximately .9 miles before terminating at the Preserve's boundary. The other way of reaching this trail to start from the Estrella Mountain Ranch Community (west of the Preserve) and utilize their trail system (yes, Estrella Mountain Ranch Community has its own independent trail system adjacent to the Estrella Mountain Regional Preserve) to connect to the Crossover Trail. As far as I know the Crossover Trail is the only trail that ties these two systems together. The Crossover Trail heads in a westwardly direction undulating slightly as it progresses. As you proceed on clear, cold days you'll see"clouds" emanating from the ground (Palo Verde Nuclear Plant) and closer in the foreground you'll start to distinguish a brown, block like building (Estrella Foothills High School). To the north you'll have foothills of the Estrella's and to the south there is a large sandy wash. The wash is hard to see for most of the trail but the green trees and shrubs that line it will identify its location. The trail itself does not change in elevation much, in fact, it only drops about 20 feet in the .9 miles. The trail is a dual track that I (seriously) believe was constructed by driving a quad with a steel screen behind it. The trail is distinct but is still pretty rocky - racked rocks. The trail people did do a nice job on the wash crossings. There are 5 minor washes that are transversed and all of them have easy entry and exit points. At .9 miles the Crossover Trail ends at a "fenced open gate". There is a pay station here for those who might be accessing the preserve from the Estrella Community. The Crossover Trail is currently not signed from this end. But as I said earlier I believe it is the only trail that connects the two systems. If you turn around at this point and return the way you came you are looking at close to a 12 mile hike. If you continue on into the Estrella Mountain Ranch trail system (via the PA trail) realize that it is 2 miles before reaching a TH so you'll want to have a car waiting for you. Otherwise it would be a 16 mile in and out. As of this writing, there is no loop attached with the Crossover Trail. Plus, please realize that the trails west of the preserve MAY be private property. 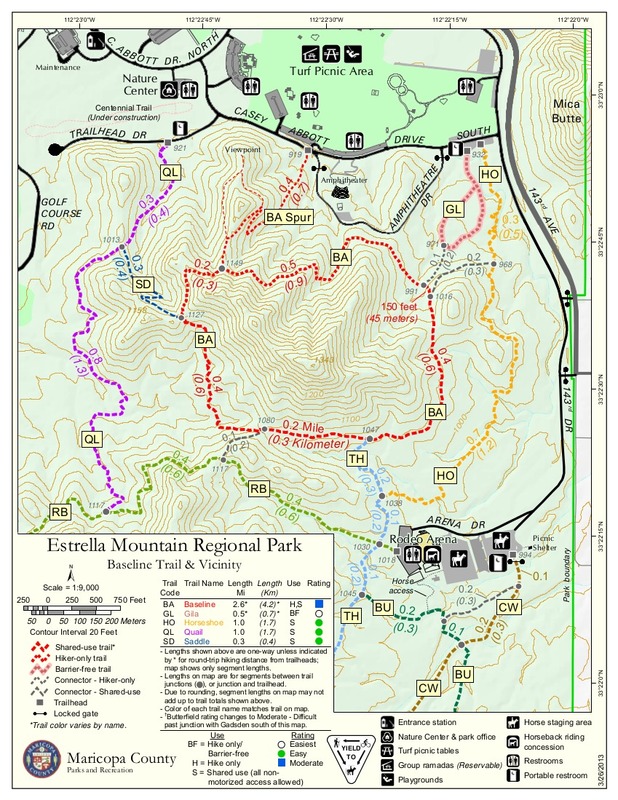 The sign at the boundary stated "Estrella Mountain Ranch Private Property" and that "designated trails should only be used for hiking and biking". Not sure if trails are open to all or residents only. More to come hopefully. Water Sources: There are no water sources along this trail. But there is a drinking fountain at the Toothaker TH which you would most likely use if you were starting from within the regional park. Realize this is 5 miles away from the Crossover Trail. There is also a drinking fountain at the Estrella Mountain Ranch Community TH. This TH is located just north of the Estrella Foothills High School next to a bike track and a park. Realize this is 2 miles away from the Crossover Trail. From central Phoenix head west on I-10 towards California. Take the Estrella Parkway exit and head south. Continue about four miles or so to West Vineyard Avenue. Turn left on Vineyard, you'll pass a golf course. Keep your eyes peeled for the right turn into the park soon after the golf course. Take Casey Abbot Dr. and follow it around the perimeter of the park. This will eventually turn into 143 Dr. as it heads south and lead to the horse staging area. 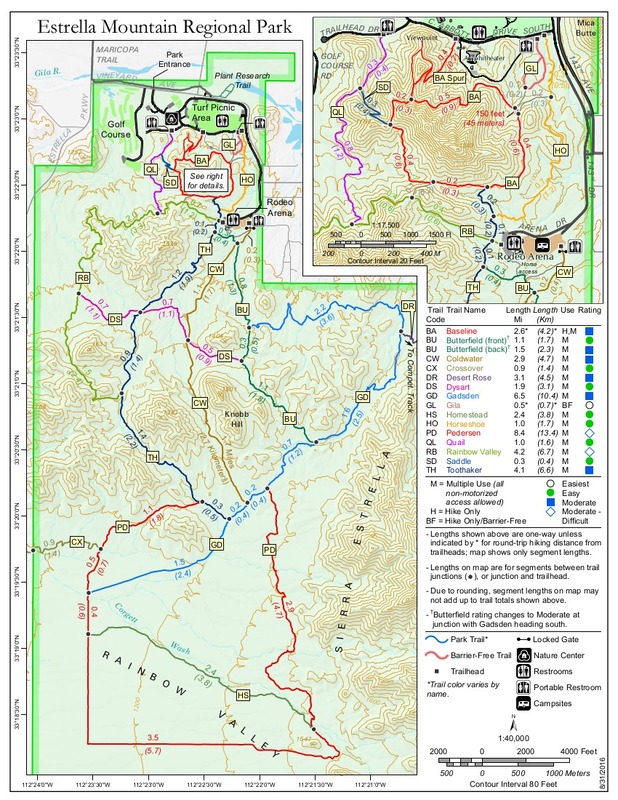 You'll want to park on the west side of the rodeo arena near the regional preserve map to access the Toothacher Trail. From central Phoenix head west on I-10 towards California. Take the Estrella Parkway exit and head south. Continue south for approximately 11 miles remaining on Estrella Parkway as you negotiate a round-about 8 miles in. About 3 miles past the round-about look to the east side of the road for the high school. Park in the dirt lot on the north side of Estrella Foothills High School. The trail system begins just to the east of the bmx track.